Indiana Retired Teachers Association and benefits partner AMBA have announced a membership contest that will award cash and trips to top recruiters. 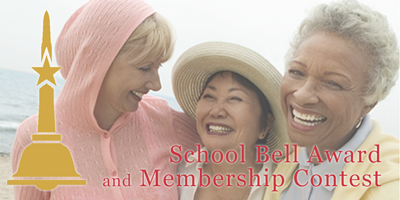 The School Bell Award and Membership Contest launches July 1 and continues through June 2019. The organization's Membership Committee wanted to recognize the IRTA member who recruits the most new members - regular or associate, said Tom Mellish, IRTA Executive Director. The first School Bell Award, sponsored by AMBA, will be presented at the 2019 Representative Assembly. The winner also will win a trip (three days, two nights) to a city of his or her choice - such as Chicago, Cincinnati or Indianapolis. AMBA will pay for the hotel, parking and $400 spending money. Members who recruit one or two new members are eligible for the drawing for a $25 gift card. Those who sign up three or four new members are eligible for a $50 gift card; and five or more for a $100 gift card. Both new regular and associate memberships qualify. Drawings will be held at the end of the September and December in 2018 and March and June in 2019. Mellish said member should invite retired Indiana educators to local chapter meetings and stress the importance of joining the state organization to support efforts to advocate for all educators. To get credit for a new membership, current members should write their names on the lower right hand corner of the IRTA membership forms. If a new member opts to enroll online, he or she should put the recruiting member's name in the Notes section of the online form. The state office will keep track of the new members and enroll recruiters into the contest. For more information about membership, visit here. Questions about the contest can be directed to the IRTA office at 888.454.9333.